Vic, from Chicago, learns that his fiancée is being stalked. This is uncomfortable especially because his late wife had also been stalked before being killed. Guy, from Los Angeles, is having dreams of a murder in 19th century Ireland. Guy learns that he has a brain tumor, which he’s told is causing the hallucinations. Guy believes, however, that the dreams are his memory of a past life and he’s certain if he can understand who he killed, he can overcome his tumor. Two stories, thousands of miles and decades … and a century … apart, with two men hunting down what haunts them, with reincarnation a theme that binds them together. Author James Kahn really challenged himself with a story this wildly diverse and intricate. Unfortunately, he also challenges the reader by not being particularly clear, especially early on, with where the story is. Some mystery is good. Even some confusion, allowing (or forcing) the reader to work hard) can be good. But it needs to be handled deftly, leading the reader forward. A trail of bread crumbs leads forward. Tossing the breadcrumbs to the wind leads nowhere. To often this felt simply tossed out. There were moments that the writing was really engaging and engrossing and I couldn’t wait to read on. But there were also moments that made no sense (to this reader) and I would backtrack to try to see what I missed. Backtracking is rarely good. I typically like a crazy, wild ride, but I never felt that I was strapped in here. The payoff was only mildly worthwhile. Looking for a good book? 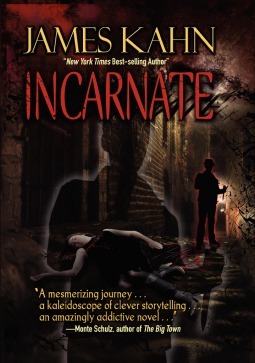 Incarnate, by James Kahn, is ambitious, and there are moments when the writing is strong and encouraging but overall the story just doesn’t flow.